Political landscape of Pakistan has been engulfed by Senate elections for the last two weeks. 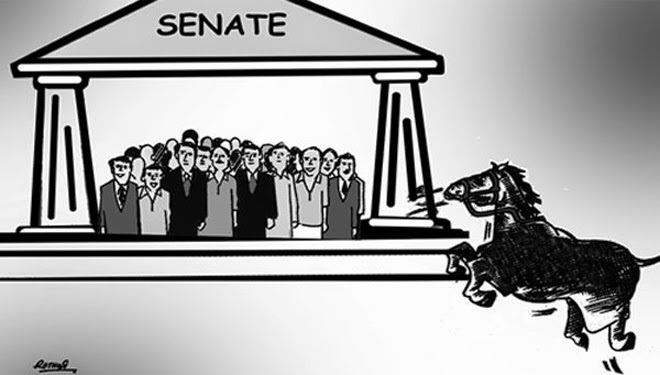 Amid controversies and cries of horse trading, Senate elections took place on March 5. Though the consensus achieved by political parties is a healthy sign for democracy, further improvements are required, especially in the method of Senate elections. Senate is the upper house in a bicameral form of legislative setup. Numerous countries around the word have Senates that serve the purpose of legislation and oversight. In Pakistan, Senate was introduced in the constitution of 1973. Senators are elected after every three years indirectly through an electoral college for a term of 6 years. Senate in Pakistan has limited authority and prime minister can’t be picked from the Senate neither a money bill, commonly called as federal budget, can be passed by it. Indirect elections for Senate have made it infamous for horse trading where investors can buy their way in. It is also used to politically adjust those politicians who can’t win popular elections. Senate of Pakistan gives equal representation to all the federating units of Pakistan and thus it is very important. However, the nature of Senate elections has resulted in bringing into the house those people who are not genuine representatives of the public. Senate in Pakistan can be reformed on the pattern of US Senate. The US Senate was established in 1789 and the initial method of elections was indirect through state legislatures. With the passage of time, American politicians realised that through indirect elections, Senate is not serving its purpose well. As a result 17th Amendment in the US constitution was passed in 1913 which laid down the mechanism of elections for Senate through popular vote. Today, there are 50 states in US and every state elects two senators, irrespective of its population, through direct voting of public. The 17th Amendment helped in making Senate more representative in nature and suitable for good governance. The suggested electoral reforms in Pakistan have certain drawbacks that can’t be ignored altogether. Conducting a direct election after every three years would be an extremely difficult exercise keeping in view the security situation. This method will also result in increasing the costs of elections. The biggest hurdle would be the political parties of Pakistan which prefer the indirect method of election due to vested interests.The US model of Senate can be successfully replicated in Pakistan. After every three years, elections for half of the Senate seats should take place through direct voting by the public. This will result in electing true representatives of people. Another major benefit of this method of election would be direct voting after every three years. Senate polls between the tenure of a sitting government would act as mid-term polls. The incumbent government would be compelled to serve people and produce results as it has to face direct elections after every three years. This would also help improve governance in the country. Total expenses incurred on general elections of 2013 were Rs23.96 billion. We can assume that direct elections for Senate would cost Rs12 billion because there would be fewer constituencies and candidates. In the absence of information about cost of Senate elections under indirect voting, we can modestly estimate that Senate elections cost Rs2 billion. This means that Rs10 billion extra would be needed to implement the system of direct elections. Given the expected political and governance benefits, this amount is not too much to make the suggested reforms unfeasible. Security will not be a problem in major part of the country to prevent the conduct of elections. The restive areas can be pacified by the time this reform is materialised in next few years. Public consensus on this issue would force the political parties to accept the direct method of elections. Moreover, Rajya Sabha is the upper house of Indian parliament. Members of Rajya Sabha are elected through indirect election but there is another provision in its election. The Indian president nominates 12 members of Rajya Sabha from the fields of arts, literature, science and social services. Through this way gems of the society are integrated in the parliamentary politics and their inclusion entails numerous benefits for the country. Same provision can be added in the Senate elections of Pakistan. After electing required number of senators through direct polls, the president of Pakistan should nominate fixed number of persons who have achieved distinction in the fields of literature, music, art, science and so on. This would bring the much needed scholastic element in the Senate of Pakistan. Approval of 21st Amendment overnights proves that constitutional changes can be made in Pakistan when the political leadership shows its resolve. In order to make Pakistan a viable and robust democracy, direct elections for Senate are inevitable.